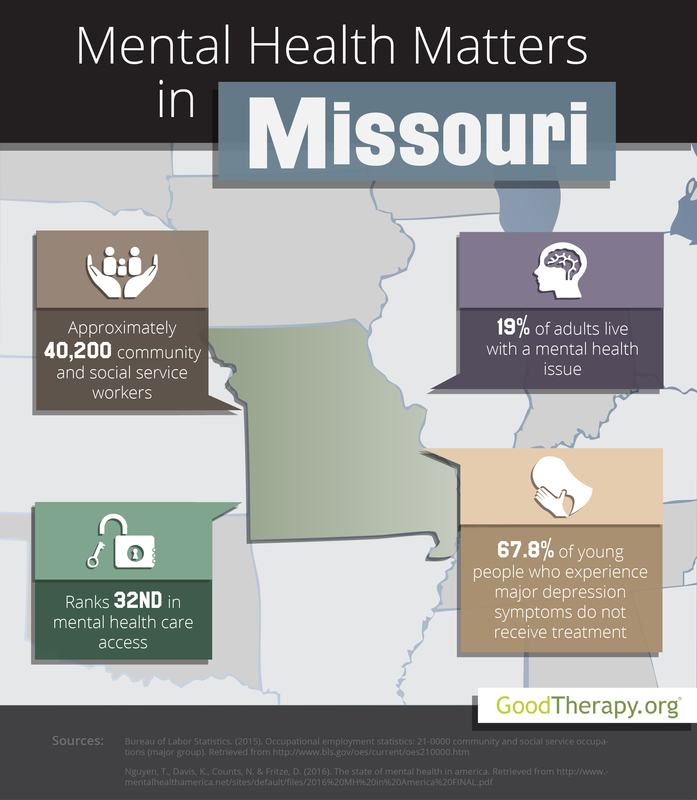 Find a therapist in Missouri with GoodTherapy.org. Approximately 6 million individuals lived in Missouri in 2015, according to data from the United States Census Bureau. The state population was made up of 83.5% white residents, 11.8% black residents, 1.9% Asian residents, and 0.5% American Indian and Alaska Native residents. Minors accounted for 23% of the population, while the elderly—65 years or older—made up 15.4%. Females comprised 50.9% of all residents. Reports from the Bureau of Labor Statistics show 40,200 residents currently work in community assistance and social service fields in Missouri. Therapists, clinical social workers, parole officers, psychiatrists, child psychologists, religious workers, health educators, counselors, and other workers in related fields earn an estimated yearly salary of $39,710. Every year, Mental Health America (MHA) releases the results of the State of Mental Health in America survey, which evaluates mental health care across the country. Compared to other states and the District of Columbia, Missouri was 30th for mental health conditions, resources, and practices in 2016. Additionally, the state was 30th in youth ranking, 29th in adult ranking, 28th in prevalence ranking, and 32nd in access to services for mental health treatment. In general, these placements indicate a relatively high rate of mental health conditions and a relatively low rate of access to care. Some therapists in Missouri are concerned that thousands of young residents are experiencing symptoms of depression. Data from the 2016 MHA survey shows 9.9% of adolescents in Missouri had at least one episode of major depression in the past 12 months, and 7.6% of adolescents are currently experiencing severe depression symptoms. The state was ranked 33rd and 39th in these mental health metrics. Substance dependence is another issue that may have caught the attention of mental health providers in Missouri. Therapists from the Substance Abuse and Mental Health Services Administration (SAMHSA) report that in 2012-2013, cigarette use among Missouri teens was higher than the national percentage. At 38.8%, a higher percentage of Missouri teens saw no great risk from smoking one or more packs of cigarettes per day than the national average of 35%. From 2009 to 2013, the percentage of Missouri teens who perceived no great harm in smoking marijuana once a month increased from 68.3% to 73.6%. According to the 2016 MHA survey, roughly 27,000 young people in Missouri display dependence on alcohol or drugs. Mental Health America contends that approximately 863,000 adults in Missouri experience mental health issues. The state was ranked 29th for adults with serious thoughts of suicide and 21st for adults with dependence on drugs or alcohol. According to SAMHSA, Missouri’s percentage of heavy alcohol use among adults age 21 or older was higher than the national percentage in 2009–2013. The 2016 MHA survey states 20% of adult residents with mental health issues are not insured.